This is a photo from Downtown Tampa during the Tampa Bay Lightning’s run in the 2015 Stanley Cup. The ride sharing service, Uber, was giving away SeatGeek credit to send riders to Game 2 of the Stanley Cup Finals. Expecting the giveaway to start in or around Downtown Tampa I used this as a chance to have a short photoshoot downtown. This photo is show outside the Glazer Children’s Museum on Ashley St in Downtown Tampa. 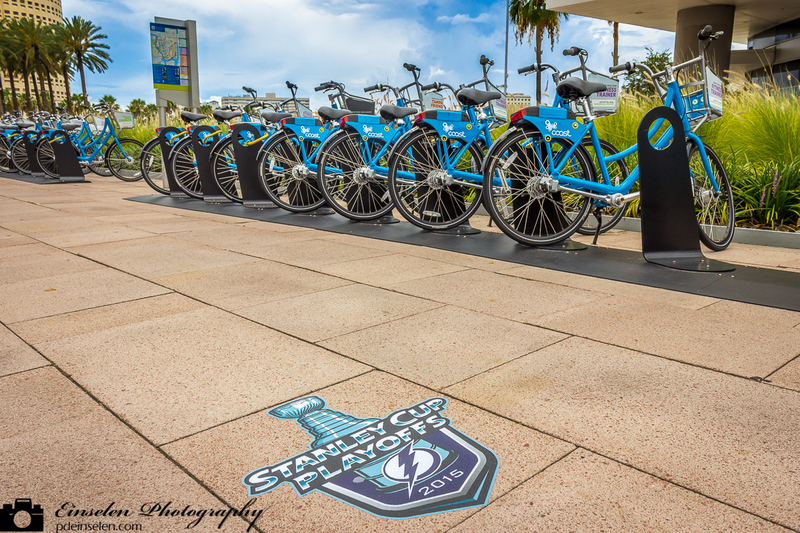 Downtown has a number of Coast Bike Share stations where you can rent bicycles for a few hours to ride around town. The 2015 Stanley Cup Final, commonly known as the 2015 Stanley Cup Finals, was the championship series of theNational Hockey League (NHL) 2014–15 season, and the culmination of the 2015 Stanley Cup playoffs. This was the 122nd year of the Stanley Cup’s presentation. The Western Conference champion Chicago Blackhawks defeated the Eastern Conference champion Tampa Bay Lightning four games to two to win their sixth championship in franchise history, and their third title in six seasons. The Lightning, as the club with the better regular-season record, held home-ice advantage in the series. The best-of-seven series was played in a 2–2–1–1–1 format, with Tampa Bay hosting games one, two, five and seven; and Chicago hosting games three, four and six. Tyler Johnson and Patrick Kane led the 2015 Stanley Cup playoffs in points scored with 23 points each.The series started June 3 and ended on June 15.